The first Cambridge Junior Chess Challenge for Girls took place on the 8th of November in Sydney Sussex College, Cambridge. 36 participants were divided into three sections (Under 8, Under 11 and 11+). Five rounds, with 25 minutes each for a game. 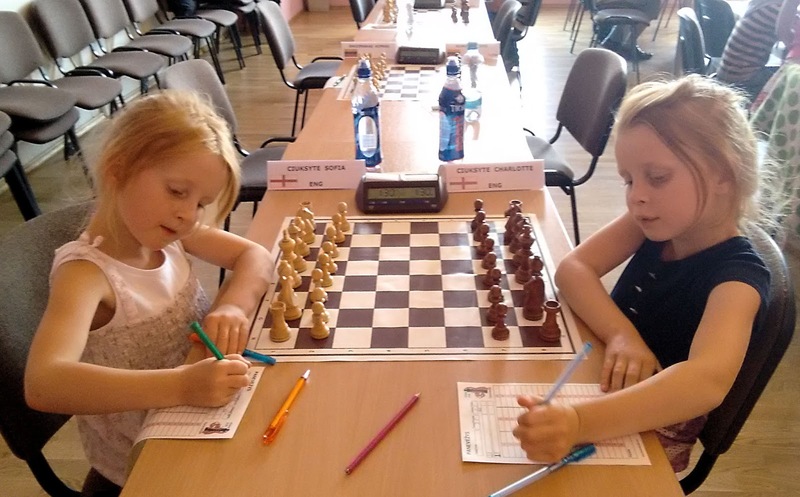 "A great event for the little girls like Charlotte (8) and Sofia (6) Ciuksyte. Charlotte, playing in the Under 11 section had fun promoting the pawns into queens (in one of the games she had as many as three of them on the board!) then showing her excellent restriction technique but found it difficult to deliver the mate. Two stalemates rather than checkmates and the total result 1 point out of 5. Look out - we know now what to work on! A big thank you to the organisers for a very well-organised tournament, a great venue and nice experience for all the participants. And I'm pretty sure there's been more of the girls coming back home and wanting to play more chess games on the same day like my Charlotte and Sofia did! Mum's dream came true!"